To Cite: Verma A K, Kalra O P. Discovery of New Drugs Against Tuberculosis: History Guides, Arch Clin Infect Dis. 2012 ; 7(4):109-12. doi: 10.5812/archcid.15088. Treatment of tuberculosis was an obstacle for ages. In spite of good drugs, the disease is not under control. Thus, the need for more drugs existed. Searching for a new drug demands much investment on the time, money and human resources. There are many drugs with antitubercular action that are discovered and explored in the last century. The most common drug, Isoniazid, is now a frontrunner anti-tubercular drug. Like the same antitubercular effect of Trifluoperazine which is known since 1990s, but due to the lack of research its anti-tubercular potential is not yet explored completely. In spite of being an age old disease, the treatment of tuberculosis is only seventy years old. It was started in 1943 with the discovery of Streptomycin. For the next twenty years after that, many new anti-tubercular drugs were discovered and cure of tuberculosis became a reality. With the advent of Rifampicin in 1963, the treatment of tuberculosis was shortened to 6-8 months. After this, many quinolones were found to have anti tubercular activity (1). At present, many new molecules are in line as ATT like, PA 824, TMC 207, OPC 67683. These compounds, if properly developed, have the potential to become a part of a future regimen that could greatly affect the global tuberculosis control effort. The discovery of new molecules for therapy in human being needs huge investment on manpower and resources. In spite of all these efforts, there are less than 1% chances of a new drug to become available for clinical use (1). Thinking on another line, let us review the history of Isoniazid development (Isonicotinylhydrazine) a hydrazine group member as the first line anti tubercular medication, in the prevention and treatment of tuberculosis. Hydrazines have their origins as expressed in the research carried out by Hermann Emil Fischer in 1870s (Figure 1). He accidentally discovered Phenylhydrazine in 1874, while he was working in the laboratory of Adolf von Baeyer in Strasbourg, on hydrazine hydrate (a powerful reducing agent). 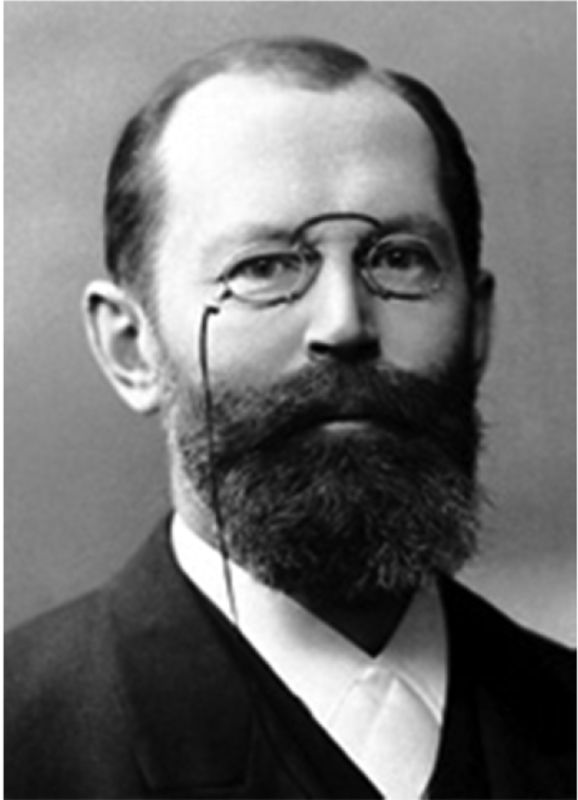 Hans Meyer and Josef Malley, of the German Charles-Ferdinand University in Prague, synthesized isonicotinyl hydrazine in 1912, as part of the work for their doctoral thesis (2). For almost 40 years the hydrazines were forgotten. In the late forties its tuberculostatic effects were found unexpectedly during an in vivo random screening, i.e. in mice infected with tubercle Bacilli. The discovery of the anti-tubercular effects of this hydrazine derivative, which took place in 1951, is due to the independent research carried out, by two scientific teams, led by Herbert Hyman Fox of Hoffmann-La Roche Laboratories (Nutley, New Jersey) and Harry L. Yale of the Squibb Institute for Medical Research (Princeton, New Jersey), respectively. In a research on anti-infectious drugs at the Squibb, hundreds of compounds were synthesized and studied on mice infected with Mycobacterium tuberculosis. In 1951, one of the chemists Harry Yale, synthesized a hydrazide intermediary (isonicotinyl-hydrazine), from isonicotinyl-aldehyde-thiosemicarbazon. The tuberculostatic efficacy of thiosemicarbazones had already been shown. However, there was enormous surprise when the synthetic intermediate (isonicotinyl-hydrazine i.e. INH), was found to have greater antitubercular activity in animal model than the final product (isonicotinyl-aldehyde-thiosemicarbazon). After this discovery, clinical trials were conducted with this compound almost immediately in different hospitals in New York State; its antitubercular effectiveness was demonstrated, and the molecule is known as isoniazid (3). The idea behind the history of Isoniazid is the speed of research, which took place after the discovery of its tuberculostatic property. Within two years, this drug was available for clinical use. Before that, only streptomycin was used against tuberculosis, but the development of drug resistance lowered its effectiveness. The discovery of Isoniazid established a combined drug regimen, necessary for effective treatment against tuberculosis. Trifluoperazine (TFP), a calmodulin antagonist. This is a typical antipsychotic of the phenothiazine chemical class. 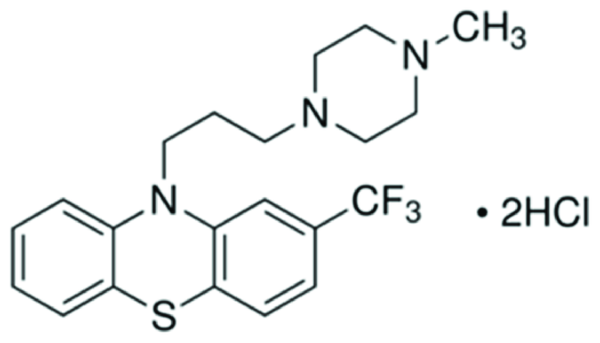 Its IUPAC name is 10-[3-(4-methylpiperazin-1-yl) propyl]-2- (trifluoromethyl)-10H-phenothiazine (Figure 2). This drug was first used in 1957. Since then, it was used as antipsychotic drug for the treatment of schizophrenia, anxiety. It acts on various receptors in human body as listed below (4). D1 and D2 dopamine receptor-antagonist, decreases the release of hypothalamic and hypophyseal hormones and is believed to suppress the reticular activating system thus affect the basal metabolism, body temperature, wakefulness, vasomotor tone, and emesis. This is the main pharmacological action site of the drug. Alpha 1A adrenergic receptor-antagonist which is another pharmacological action site of the drug. Calmodulin - which is the inhibitor of this receptor - mediates the control of a large number of enzymes and other proteins by Ca (2+). Among these enzymes stimulated by the calmodulin - Ca (2+) complex, there are a number of protein kinases and phosphatases. Troponin C, slow skeletal and cardiac muscles - is another inhibitor and pharmacological action site which is still unknown. Protein S100 - A4 is another inhibitor and pharmacological action site which is unknown. With the above description, it is clear that at present, the pharmacological action site on D1 and D2 are used in clinical cases although there are other receptor activation sites. By referring to the researches in the last quarter of the 20th century, it is clear that this molecule possess antitubercular activity. Details of few studies are described as follows. The calmodulin like proteins (CALMP) are present in many species of mycobacteria (Mvcobacrerium smegmatis, M. bovis BCG, M. phlei, M. tuberculosis H37Rv and Ra) (5-7). CLAMP also have role in the metabolism of mycobacterial lipids, especially phospholipids, as well as growth. In a study by Gadre DV et al. (8), the TFP was tested on the in-vitro growth of 50 clinical isolates of Mycobacterium tuberculosis. Of these isolates, 29 were susceptible to all five of the antitubercular drugs Isoniazid, Rifampicin, Streptomycin, Ethambutol and Pyrazinamide, and 21 were resistant to one or more of the five drugs. The minimum inhibitory concentration (MIC) of TFP was 4 µg/mL for 40% of both the susceptible (12/29) and resistant (8/21) isolates and 8 µg/mL for 55% (16/29) and 48% (10/21) of the susceptible and resistant isolates, respectively. Further analysis of the data for resistant isolates indicated that the MIC of TFP was 4 µg/mL and 16 µg/mL, respectively for 50% (4/8) and 75% (6/8) of the isolates resistant to one drug only to Isoniazid, Streptomycin or Pyrazinamide. Of the nine isolates resistant to two drugs, Isoniazid and Streptomycin, the MIC was 4 µg/mL for 33% (3/9) and 16 µg/mL for 80% (7/9). The MIC of TFP for two isolates resistant to the three Drugs Isoniazid, Rifampicin and Streptomycin was 8µg /mL for one and 32 µg/mL for the other. Out of two isolates resistant to all five drugs, the MIC of TFP was 4 µg/mL only for one but 32 µg/mL for the others. Katoch et al. (9) observed that TFP reduces the ATP level of in vitro incubated M. leprae collected from human leprosy cases. The inhibition was observed to be marginal (35% Mean) at 2.5 µg/ mL but highly significant at 5 µg/ mL (Mean 37%) and almost total at 10 µg/ mL (mean 98.5%) after 14 days of incubation. Results suggested that, although did not prove directly, the presence of CALMP in M. leprae. Inhibition by TFP suggested that CALMP may have a role in the metabolism of M. leprae possibly in a way similar to that in M. tuberculosis. The mechanism of action may also be similar to that in M. tuberculosis by inhibiting the synthesis of lipids (including phospholipids), DNA, proteins and carbohydrates. Rao et al. (10) found that TFP inhibited the in vitro growth of M. avium (MIC 20 µg/mL) at near neutral pH of 6.8 . The effects of Trifluoperazine on M. leprae as observed in this study, as well as its reported effect on cultivable mycobacteria, suggested to be a broad spectrum anti-mycobacterial compound. Ratnakar and Murthy (11) studied the effect of calmodulin antagonist TFP on the growth of M. tuberculosis H37Rv, in a concentration range of 0 - 10 µg/mL. There was total inhibition of growth at 6 µg/mL but slight growth at 4 µg /mL. For MIC determination the drug was tested in a narrow range of 0, 3, 4, 5 and 6 µg/mL. Results showed that the MIC of Trifluoperazine for M. tuberculosis H37Rv was approximately 5 µg/mL. TFP also inhibits the growth of M. tuberculosis H37Rv resistant to isoniazid with MIC value 8 µg/mL. The slightly higher MIC of Trifluoperazine for the susceptible strain of M. tuberculosis H37Rv (5 µg/mL) was either comparable to that of streptomycin (4 µg/mL) or slightly higher than that (2 µg/mL) of Rifampicin. Even the MIC for the ionized-resistant strain (8 µg/mL) is only slightly higher than that for the drug susceptible strain. They suggested that TFP in combination with other drugs used for conventional antitubercular therapy has the potential to be a useful new drug against tuberculosis. Taking lead from these observations, a clinical trial was done by Gupta et al. (12) on a limited number of tuberculosis patients with a dose of TFP which is known to be tolerated well with no side effects in combination with other antitubercular drugs. In this study, sixty patients attending the surgical out patients department, irrespective age and gender, diagnosed with tubercular lymphadenitis, constituted the subjects. Patients were divided into 2 groups of 30 each. For ethical considerations, patients of both groups were initially provided with WHO recommended standard antitubercular therapy (ATT) for one month. TFP was given in one group only for 15 days, at a dose of 5 mg/day. Group 1: patients received ATT and TFP for 15 days from day 31 to 45 and the treatment continued with ATT only for the remaining period of therapy. Group 2: patients received only ATT. ATT consisted of isoniazid 5-10 mg/kg, rifampicin 10mg/kg, ethambutol 15 mg/kg and pyrazinamide 30 - 40 mg/kg. All the four drugs were taken for two months then Isoniazid plus Rifampicin were taken during 6 - 8 months. Assessment of the antitubercular activity of the serum of patients treated with ATT or ATT plus TFP was done (Table 1). Although O.D. is a quantitative measurement for the number of Bacilli, it can be argued that the scope of contamination and O.D. are likely to be as a result of not only mycobacteria but also the contaminants. As mentioned in Table 1, six and four samples of group 1 and group 2 - respectively - were contaminated and excluded from the analysis. However, in order to make sure, a smear of the medium, after measuring the O.D. after 45 days, of growth was made on a slide and stained with Ziehl Neelsen stain. All the Bacilli included in Table 1 were found to be acid fast mycobacteria (AFB) without any contamination. Furthermore, this clearly conforms that the serum of patients treated with ATT and TFP had much greater antitubercular activity than the serum of patients treated with ATT only. This also shown that, although the MIC of TFP was higher when used alone, its antitubercular activity even at a small dose of 5mg when given along with other drugs of ATT was quite good. This is probably due to the fact that not only TFP but also its metabolites might have antitubercular activity. All in all, it is concluded that TFP can be the second drug in continuation with INH, when a drug used for treatment of other diseases is available for treatment of tuberculosis. We can also draw a parallel between INH and TFP. TFP seems to be a potent candidate for treatment of tuberculosis, but it lacks support in large scale studies (Table 2). We can see from this review that in 1950s the development of new drugs for tuberculosis was due to the urgent need of west. So they come out with a new drug against tuberculosis (INH) within two years of finding that the molecule has some antitubercular activity. With their research and advances, they are now able to treat the disease sufficiently. Now in the current time, the need of countries like India and other high burden nations caused to find out new molecules for prevention and treatment, because of the growing incidences of MDR and XDR tuberculosis. This study (Gupta et al. (12)) makes the way for larger study with longer duration of co treatment with TFP. Surprisingly this study was done in 1998 and subsequent trials have not been accomplished, since then. It is concluded that TFP is next in line as ATT is properly researched and we may seek a new drug for treatment of tuberculosis in next few years. We wish to thank Prof. PS Murthy for his continuous encouragement and support. Implication for health policy/practice/research/medical education: To change the pattern of Tuberculosis, better and more effective drugs are needed. This article highlights how we can develop new drugs against TB by taking guide from the history. CONTEXT- Globally, there are ongoing searches on new drugs against tuberculosis. Out of many potential candidates, Trifluoperazine is also a candidate. Its anti-tubercular activity has been known since the last two decades. If we can plan for further studies, it may come out as a new anti- tubercular drug. Authors’ Contribution: Study concept and design: Dr. O. P. Kalra, Dr. P.S. Murthy, data collection: Dr. A. K. Verma, analysis and interpretation of data: Dr. A. K. Verma, drafting of the manuscript: Dr. A. K. Verma, critical revision of the manuscript for important intellectual content: Dr. A. K. Verma, statistical analysis: Dr. A. K. Verma, administrative, technical, and material support: Dr. A. K. Verma, study supervision: Dr. A. K. Verma. Financial Disclosure: Dr. A. K. Verma and Dr. O. P Kalra disclose that they have no financial interests related to the materials of the manuscript. Funding/Support: There was no fund or support for this study.